Renault is pondering limiting its involvement in or withdrawing from Formula 1 for 2010. Just days after Toyota announced that it had made an about face and was planning to pull out of Formula 1 before the 2010 season, another manufacturer might on its way out the door. The Guardian reports that French car maker Renault held emergency talks on Wednesday to discuss its Formula 1 options for next season, including reductions in involvement ranging from reducing its commitment as an engine supplier or withdrawing entirely. 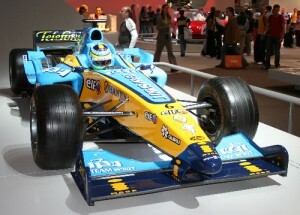 Reuters today reported that Renault will be making a final decision on its Formula 1 future by the end of the year. Renault’s 2009 season ended in a furor over allegations of race fixing that led to a suspended permanent ban and a lifetime ban for former principle Flavio Briatore.